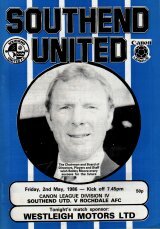 Bobby Moore resigned as manager of Southend United on Friday April 25th 1986 for 'personal reasons'. His 2 years at Roots Hall proved to be his only spell as a League manager. On April 26th 1986 brothers Tom and Tony English were both sent off when playing for Colchester United against Crewe Alexandra. Crewe's Gary Blissett also received his marching orders in the 2-0 victory for Colchester. Champions Swindon played 6 away Division 4 games on the trot - and won them all!